When we last met Hattie Jackson, she and her family, friends and pet rats were battling ninja warlords up in Northumberland, in that most atmospheric of locations, the Kielder Forest. At the end of Stalking the Enemy we were left hanging everso slightly in mid-air by several unresolved storylines, not least the continued existence of the bad guys and the ambivalent position of Hattie’s long lost twin brother Toby. Curse of the Diamond Daggers picks up where Stalking left off and races along at a terrific pace as what appears to be half of Camden descends on the unsuspecting town of Okinato in Japan to take part in a local festival. 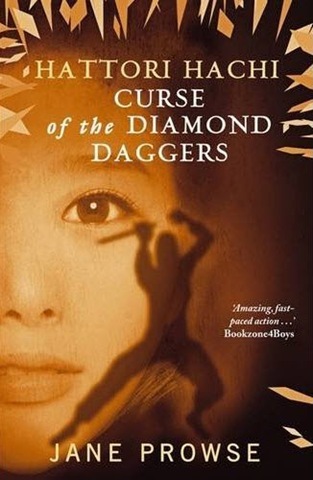 One of the great joys of the Hattori Hachi books is that Hattie, while being The Golden Child with A Scary Destiny to fulfill, is also a perfectly normal teenager with a perfectly normal set of teenage preoccupations – like GCSEs and Boys – all of which she attempts to fit in around ninja battles in the laundry and seeking to reunite the three diamond daggers. 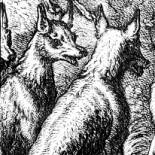 The whole set of characters from the first two books is present and accounted for: Hattie and her parents, Yazuki, Neena, Toby and Mad Dog – to which are added the new characters of Riku and the mysterious Kuyu. Because it was a year or so since I’d read Stalking the Enemy it took me a while to re-establish a firm grasp on who everyone was, but fortunately there are enough gentle ‘last time on Hattori Hachi’-type hints for me not to have to go and unearth Books One and Two for a quick re-read. That is, of course, the trouble with trilogies – you pretty much have to remember what went before to make complete sense of what you’re reading, but Hattie and her friends and family are such fun to read about and so well-rounded as characters that Curse of the Diamond Daggers would in fact work as a standalone book if it was the first one you came to, although I recommend reading The Revenge of Praying Mantis and Stalking the Enemy first for maximum enjoyment. In the midst of all the breathless ninja adventures, Jane Prowse introduces some subtle and convincing character development, a surprisingly sombre visit to Nagasaki and even some healthy lifestyle hints, none of which slow the narrative drive or come across as preaching – but they do give the book a deeply moral heart in amongst all the headlong action. Well, I do enjoy a deeply moral heart amongst my headlong action, so I’d like to read this too. Also: great cover. Delighted to see that the third volume is out and the cliffhangers of Stalking The Enemy resolved. This is not my usual fare, but your reviews are very enticing – thank you! I think it’s great to have a strong female hero in a book aimed at this age group. And rats too, they are unconventional pets, so kudos to the author for thinking outside the box in so many ways. You do always makes this series sound exciting, so that I’m thinking of trying them. I couldn’t wait to read this and I’m loving it! I loved the first two and so far this is keeping me gripped – excellent stories. This entry was posted on December 4, 2012 by Moira in Entries by Moira, Fiction: 21st Century, Fiction: children's, Fiction: young adult and tagged Hattori Hachi, Jane Prowse, Japan, ninjutsu.